Tatanka Arts is a new arts organization serving the Redwood and Renville County Area. Tatanka Arts board members are recruiting new members who are artists and arts supporters. We want to promote the fine arts in our communities by sponsoring fine art festivities, arts enrichment opportunities, mentorships, classes and workshops. The following is a time-line of the development of the “Town Square Park” Project. It is meant to give basic information and recognition of the many people who give donations of money, time and/or talent toward this ongoing project. Ramona Larson, Project Manager & current Tatanka Arts President, extends her personal THANK YOU to all, especially Thrivent Financial, who have made the Park possible! Redwood Falls Port Authority transferred empty lot to Redwood Falls Park Commission for the development of a downtown park. Tatanka Arts hosted a Community Conversation to gain input on park design. Main amenities wanted in the park included shade, seating and activities. Tatanka Arts finalized IRS status as a public charity 501(c)(3) organization with help from a grant from the Southwest Minnesota Arts & Humanities Council with funds appropriated through the Minnesota State Legislature. 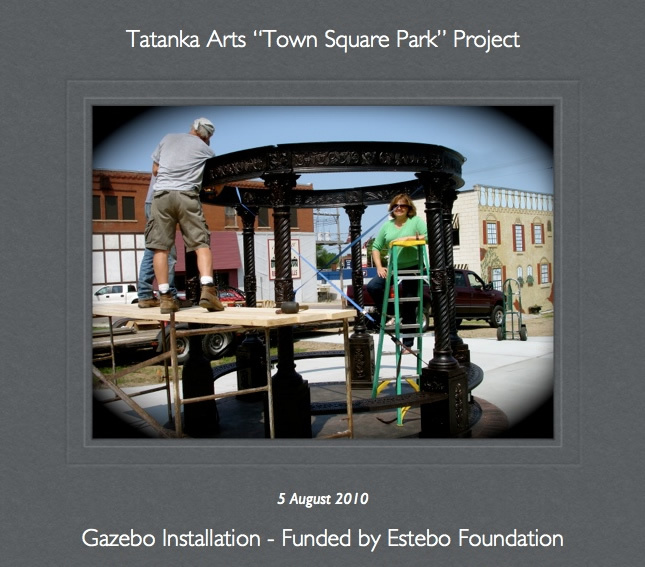 Cast Iron Gazebo purchased with donation from the Orrin Estebo Foundation. City of Redwood Falls becomes a partner in planning & implementation. Finalized a design plan with funding help from the Blandin Foundation & Thrivent. Concrete pour of new sidewalk, gazebo installed, ironwork planters installed, electrical work, dirt work, all trees donated & planted. See listing of all donors who contributed throughout the project. Installation of more seating and fixtures in the park with help from the Minnesota West - Redwood Falls Campus; Bremer Bank, Minnwest Bank, Thrivent and individuals.